The grass grows in patches at the top of the hill. A young but haggard-looking woman in a blue shawl squats to pick up shards of a factory-issue white bowl. She places them on a plaid napkin -- but neither her eyes nor her mind focus on her task. She looks into the distance, with a pensive countenance that stops short of distraught. Behind her rises a sapling, still lashed to its aging planting stakes with a loop of hose. In the background, a woman with a ponytail and a man carrying a large cardboard box walk away together. That is Michèle Fenniak's painting "The Gathering," described in one hundred words. Can you see it? You can see it, but only at the Brattleboro Museum & Art Center through August 5. While the new "Worth a Thousand Words" exhibit features narrative paintings, the stories they tell are visual, not verbal. A translation into words -- even if we added 900 of them to bring it up to the conventional 1,000:1 exchange rate -- cannot reproduce a painting's immediate visual presence. What does it mean, then, to define a painting in temporal terms -- as "narrative"? Most of the famous narrative paintings of the past depicted a scene that had already been told in words: Adam and Eve being banished from Eden, Washington crossing the Potomac. That is the sort of narrative representation that went out of vogue more than a hundred years ago while the modernists worked to return art to its radical essences. But after the more recent rise of photography and film as legitimate art forms, the narrative painting may be making a comeback -- in a wholly new form. 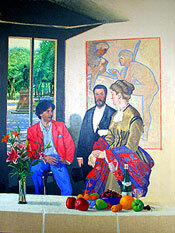 The paintings at the BMAC do not record stories that have been told before. Instead, they make it clear that Something Has Happened, without necessarily specifying what. They employ a sense of mystery that frequently borders on surrealism to tease questions out of the viewer's mind -- questions that, for the most part, teasingly resist answers. Why, in Matt Brackett's "Casting Off," are a group of kayakers in bathing suits and life jackets attempting to paddle a large rock in the middle of the sea? 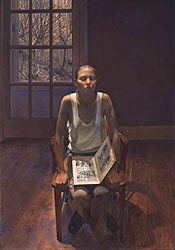 Why does the young woman in the wooden chair in an otherwise empty room in Trey Friedman's "Leap Year" have her book upside-down in her lap, such that the viewer can read the comic-book history of the colonization of Massachusetts? We can plainly see that something is amiss, but we will be waiting for a very long time if we expect these paintings to explain what it is. The "Thousand Words" pieces have a lot in common with traditional narrative paintings. Despite the confusing plot clues, most have a viscerally discernible mood. They go well beyond conventional portraiture in their subtle depiction of emotion through stance and facial expressions. The titles are an important part of the viewer's interpretation. 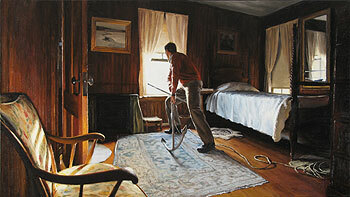 But they set themselves apart from traditional narrative paintings by engaging the viewer in telling the story. Philip Geiger depicts apparently domestic scenes in apparently private dwellings -- but the inhabitants do not have an obvious familial relationship. 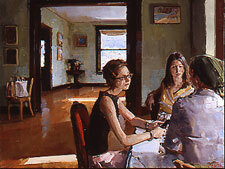 "Two Sides" portrays a small girl, several adults at a table, a dog and, in the foreground, a young woman who is stepping from one side of the large apartment into the other. Who are these people? What is so important about this ordinary-looking moment? The painting does not explain, so we must do it for ourselves. "The Boy with the Trumpet"
Paton Miller's large collage pieces, with multiple layers of canvas and liberal use of black lines, stand out in this exhibit among their glossy, more-real-than-life companions. They are sketchier, but no less powerful. 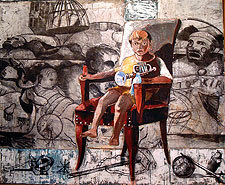 The small child in "The Boy with the Trumpet" sits in a chair and clings to a number of objects, the most prominent being the instrument named in the title. His feet barely dangle off the edge of the seat. He and his toys are in color, while all around him swirl a group of black-and-white nursery images -- some more definable than others. Are these his dreams, his memories, his wishes? In "A Quiet Day in Central Park" by Herman Braun-Vega, a policeman looks suspiciously at the viewer. Beside him, a cubist, sporting what appears to be Elizabethan costume, paints on newspapers from the Clinton impeachment era. The scene does not at first look as strange as it sounds: it really does appear to be a quiet day in the park, until you get close and start to ask yourself a few questions. What is Braun-Vega trying to say about artistic anachronisms? And why does that policeman keep looking at me that way? You might just have to go find out for yourself.